I have no problem with trucks or guys hopping up their turbo diesel trucks for performance. I do hate it when they rig the truck to belch black smoke, annoying all the other drivers on the road, and unnecessarily polluting the environment. 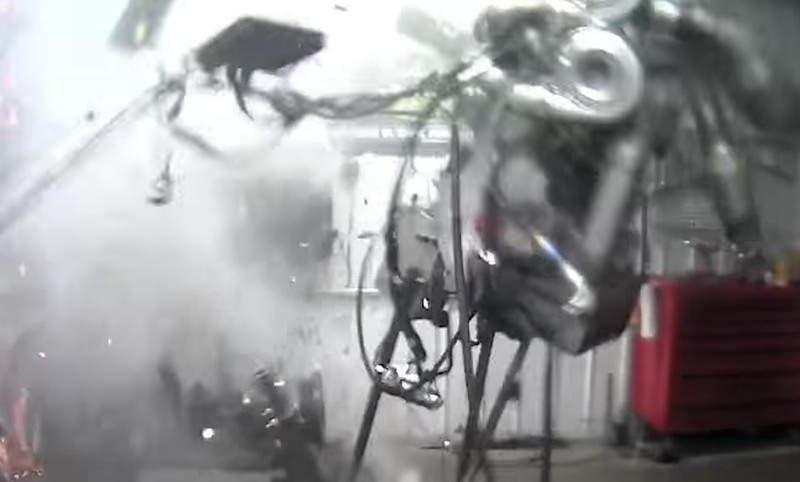 That’s not what happened here, but the amped-up diesel engine in this video creates the most intense dyno explosion I have ever seen. Road & Track says that the triple-turbo’ed Cummins diesel engine from Firepunk Diesel was running at a gargantuan 146 psi of boost and over 2200 hp when it blew. The engine self-destructed with such force that it separated its top half from the bottom, then you get to see the sad and decimated pistons flopping around before finally dying. Whoever had spent all that money on the engine has to be crying right now. Watching the test had to have been an emotional rollercoaster ride for that guy – going from glee at the massive power output, to shock and horror as half your engine flies across the room. If you want to cut to the chase, the explosion is at about 3:30 in the video.